I always wanted to travel across Karelia peninsula from Vyborg to Priozersk. 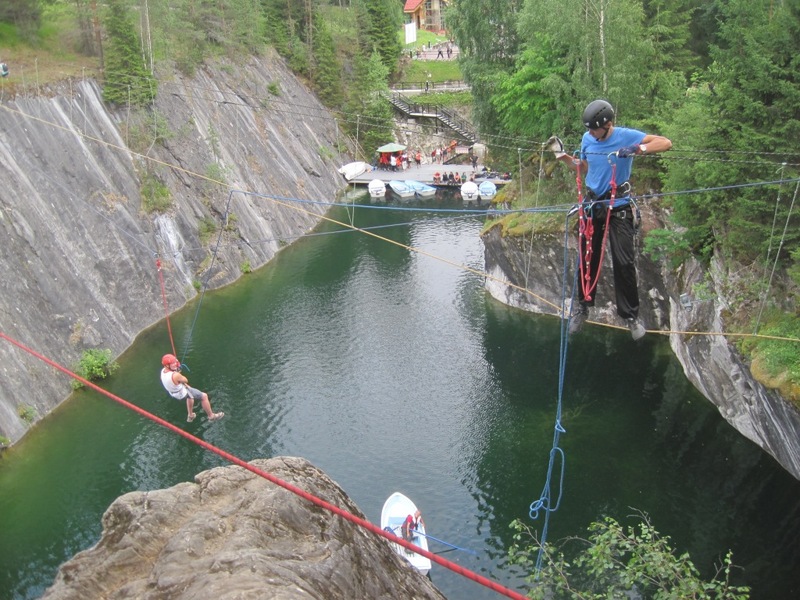 It is sounds like very logical trip, crossing peninsula from Finnish bay to Ladoga lake. But it was impossible before because it was prohibited border control area. The sign is still there, see attachment. However times are changing. Now prohibited area is shrinked. "Only" area of 5 km South from the border with Finland is closed. It made my trip possible. Because of its proximity to Finland, Vyborg is more civilized than most of Russian provincial towns, definitely nicer than Priozersk. I visited a prison cell where I was shortly detained 45 years ago, see picture. My friend, late Leonid G. and I went for rock climbing on some rocks located behind the Vyborg city park Monrepo. 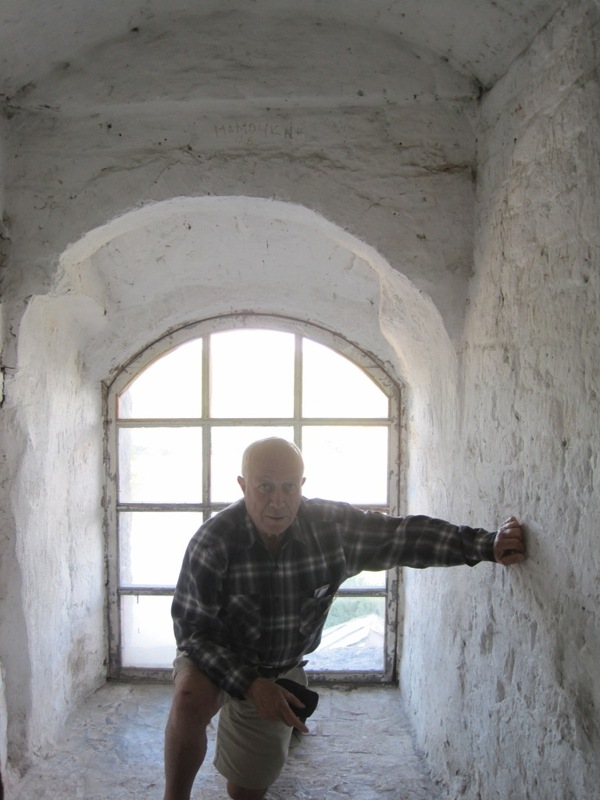 We were arrested by border guards and put in separate prison cells in city tower, now a museum. Several hours later, when our identities were verified, we were released with a small fine for entering border area without permission. 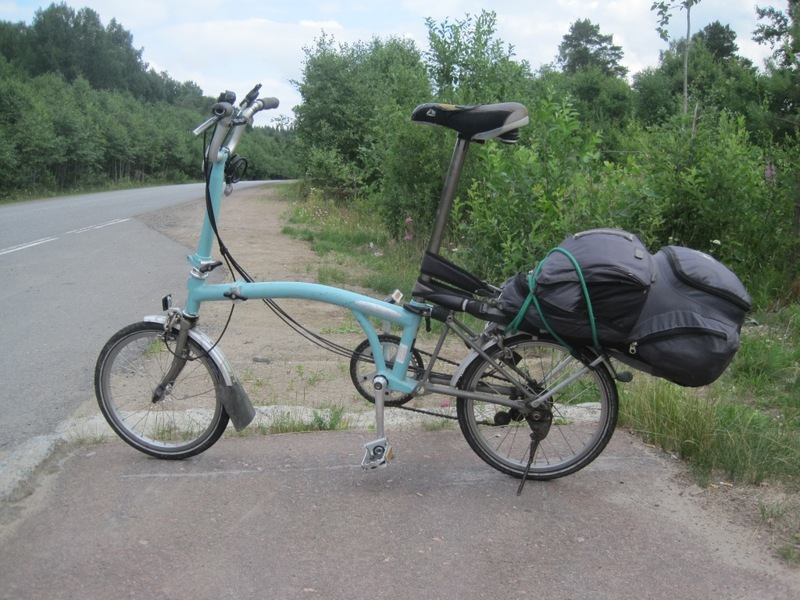 Part of my route from Vyborg to Kamenogorsk was not nice. Road was without shoulders and busy with truck rushing in few centimeters from my bike. But pine forest around was beautiful. Our Northern forest is so welcoming and kind! It has no poison ivy or poison oak, no poison berries, and most of berries are edible. There are few poison mushrooms, but every child can recognize them. It was strawberry season. 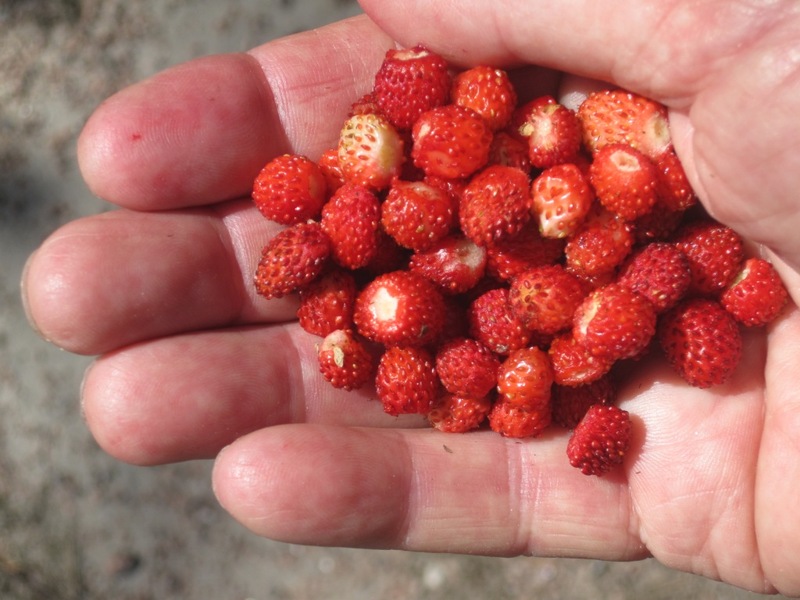 Forest strawberries are very sweet and aromatic, unlike these which you can buy in supermarket. After Kamenogorsk traffic became less intensive. But forest was mostly gone due to terrible, barbarian logging. Ironically, forest in Vyborg region was saved because it was in prohibited border control area. 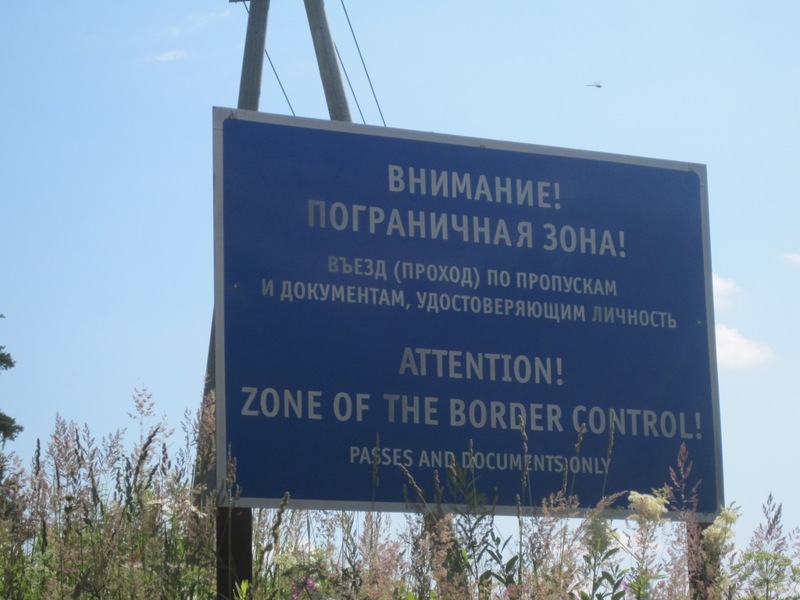 Priozersk region is not in border control and still under intensive logging. I slept for two night in tent and third night in Priozersk hotel. I took a train from Priozersk to Sortavala. I wrote about that railroad in my Travel Notes before: http://www.foldabikes.com/CurrentEvents/Story/stpeterburg.html. Three car, half empty (not every day) train goes through virgin forest with few abandoned train stations, with such old Finnish names as Huuhkanmaaki, Kuokkaniemi..amazing, mysterious places. There is no automobile roads to most of these places, only railroad. Along the busy automobile road from Priosersk to Sortavala forest is destroyed. This is a usual price we pay for civilization. From Sortovala I took two days trip by bicycle to marble quarry and back. Then I took a train to Petersburg. 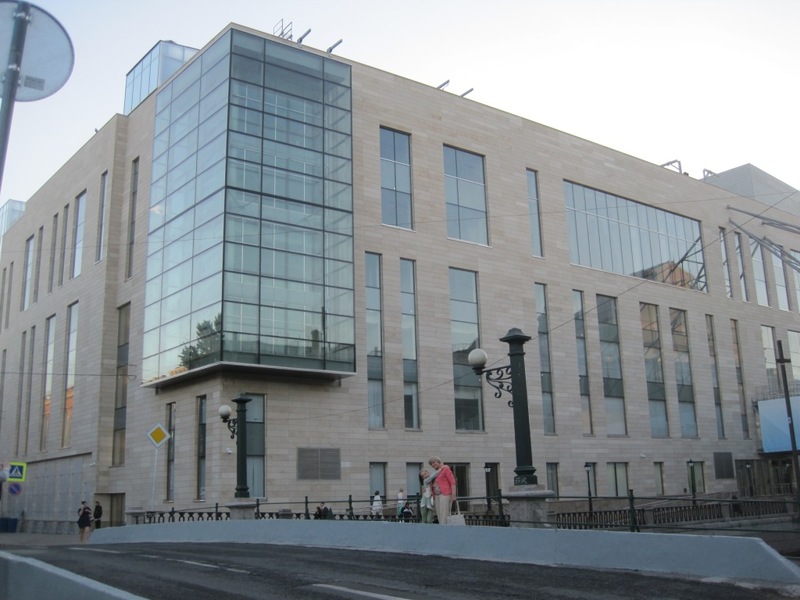 PS: It was big event in Saint Petersburg this spring - the opening of the new building of Mariinskii Opera Theater, see picture. It is very difficult to create something really remarkable in modern architecture. I saw only few examples like Sydney Opera theater, Burj Al Arab in Dubai and Bank of China Tower in Hong Kong. Most of these boxes from glass and concrete which are built recently in Petersburg are ugly. Unfortunately new building of Mariinskii Theater is one of them. What is this, an office building, manufacturing plant or shopping mall? Nothing in this design tell us that it is the Opera Theater! 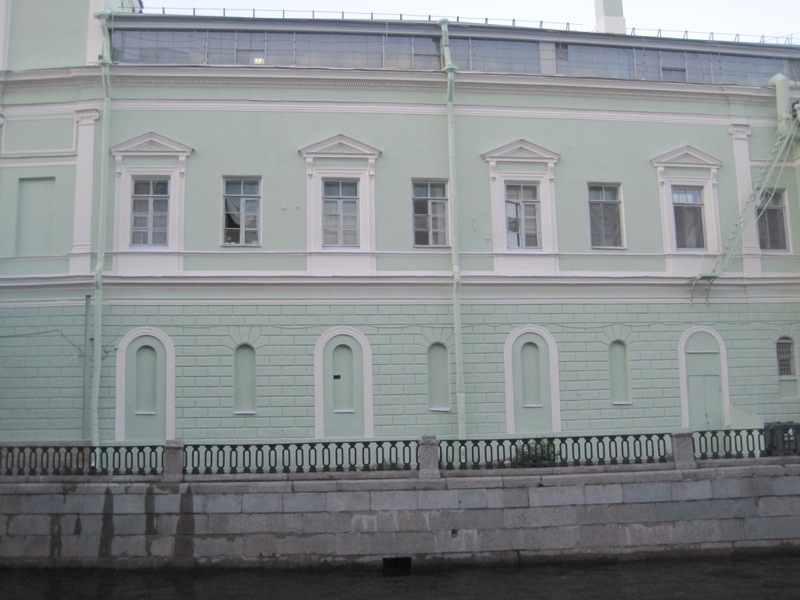 On next picture you can see rear side of old Mariinskii theater, across from Krukov canal. 50 years ago, after finishing mountaineering school in the Caucasus, I was crazy about climbing. I climbed by waterspouts to my apartment and to my girlfriend's windows. I also climbed on the roof of Marinskii Theater by one of waterspouts which you can see on this picture, It was probably the most weird thing I did in my life...so far. My next destination is Norway. Norway was not on my priority list. It seems to me to be a wealthy, quiet, safe and boring country. All of this may be true, but it is also a very very beautiful country. Main attractions of Norway are not lined up along a single line and they require some going back and forth. I will describe to you the route, which I have chosen after many hours of research. From Oslo I took a train going to Bergen, then exited the train at the train station Finse and rode my bike up across the mountain ridge dividing West and East of Norway. It was tough as there was a strong head wind. Sometimes road went through snow fields. I spent a night below the snow line in my tent near the village Myrdal. It was nice. I made a small fire and prepared noddle soup. I also still had some vodka which I brought from abroad. In Norway 0.5 liter of vodka cost 40 dollars. At sunset clouds were below me. In the morning I rode down to Flam. Most of people use famous Flam railroad. It was a very, very steep descent, sometimes it was not bikable for me. Small wheels are not good on loose gravel roads. From Flam I took a ferry boat to Gudvangen, which is Norway's one of two most popular and scenic routes. Then I took bus to Voss and then to Bergen. From Bergen I made one day bike excursion to the chain of islands connected by road, called Oy-garden. At the end of the road at village Hellesoy, there is a camping, which I would like to visit again, stay there, and possibly snorkel. Water is crystal clear with some big orange jellyfish slowly swimming against the current. I swam also, but it is pretty cold, you need a wetsuit. It is possible to take a six day cruise ship from Bergen to Kirkenes visiting most scenic fjords. But it will be difficult to maintain on the cruse ship my regimen, which I tried to follow on my trips: "eat less, ride more". So from Bergen I took a bus to Songdal. From Songdal I rode bicycle to Fjaerland, and then to Skei and Byrkjeio. 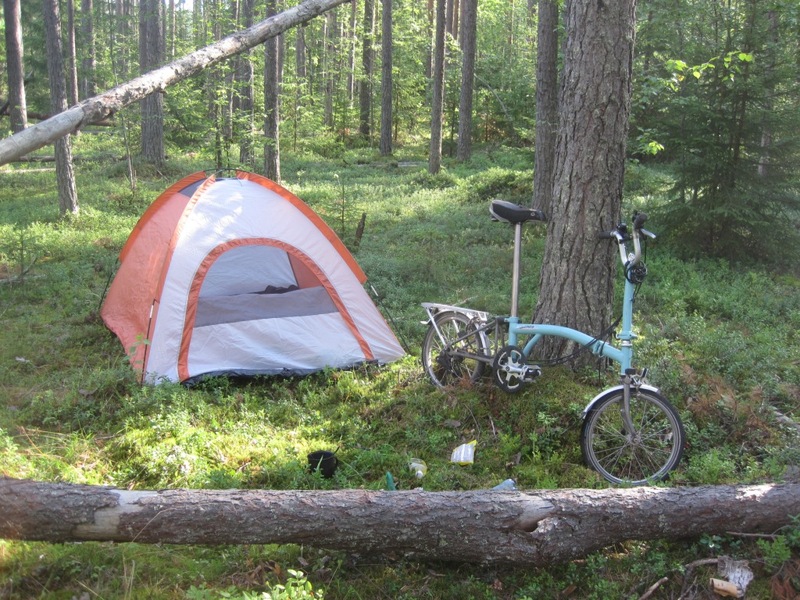 I tried to bike from Byrkjeio across mountain ridge to Utvik (500 meters vertical ascent), but was forced by heavy heavy rain to return to Byrkjeio, and spend the night in a camping. The next day I hitchhiked up to Utvik. Hitchhiking is not easy in Norway by the way. Then I biked through Innvik, Olden, Loen, and Stryn till Erdal. At Erdal I took a public bus to Langevarn located at the beginning of the famous Geinranger Trollstigen (troll's ladder). Then I rode down to to the village of Geinranger. Amazing road, one of Norway's main attraction (800 meters vertical descent, 10% incline). I spent four nights in tent during this segment. It is better to camp in the wild, than in a camping. It is allowed in Norway. It is difficult sometimes to find a flat surface to pitch a tent, as this part of Norway is located on the slopes of fjords. Best places are near old, abandoned roads going around built later tunnels. They usually also have a good view. Once, I pitched a tent on somebody's property, unknowingly. Owner came and allow me to stay till morning. Going through tunnels is not so dangerous and scary as it seems to be. But long tunnels can be exhausting. There are a lot of berries in the forest, strawberries, raspberries even red currant. Also it is mushroom season. I made mushroom soup. Here there are the same mushrooms as in Russia, so I easily recognize them. There is no chance to be poisoned. From Geinranger I took a boat to Hellesylt along famous Geinranger fjord. This fjord is the second of two main attractions of Norway and there are many huge oceanic cruise ships going back and forth through this narrow, but deep fjord. Then I took a bus to Alesund. Alesund is nice town full Art Nouveau buildings. I stayed in "so to say" luxury hostel. They even give you "breakfast in a box" if you depart before the breakfast time. As cruse ships arrived, the town gets filled with lots of people with walkers and on wheelchairs. Looking at them, I think how lucky I am. My walking capabilities are considerably reduced now due to arthritis and without folding bicycle I would probably also be in a wheelchair. Eight times during my trip I met two French ladies, see pictures. Amazingly we had chosen exactly the same route, which also indicated that it was most logical one. Ladies traveled with suitcases, but stayed in campings. From Alesund I took a bus to Trondheim, then night train to Bodo. From Bodo I took a boat to Lafoten archipelago. I rode bike from most Southern Lafoten town with interesting name "A" to North. I wanted to reach Leknes, where bus to Tromso starts, but miscalculated the time and as a result had to ride my bike till midnight. I put up my tent somewhere near the road and at 6 am took next bus to Tromso. In Tromso I spent two nights camping. Tromso is the most Northern University town in a world and generaly a pretty nice place. Then I planned to take two long bus rides, one from Tromso to Alta and another from Alta to Kirkenes. But in tourists information they suggested I take a boat. Boat was quite expensive. But when I was a student I was quite successful in the popular with backpackers and alpinists sport - riding without tickets. I decided to try, if my skill is not lost. I did it! It is quite an adrenalin pumping exercise. I know that some of my Western readers will condemn me. But when I was grown up riding without tickets was not considered as a sin. Norway is known to be a very expensive country. Again, there are no expensive countries for the experienced traveler. I spent five nights in Bergen in Vandrerhjem YMCA hostel for 30 dollars per night (cheapest in town) in 40 bed dorm. 40 bed dorm is not as bad as it sounds. Participants are quite civilized young Western travelers and facilities are also quite adequate. As for food, very small open sandwich with whale meat at the Bergen sea food market costs 5 dollars. I asked sales lady how much it will cost for me to buy the entire fish. She quickly got a calculator and told me that it will cost me 1,600,000.00. Norway is still whaling. See whaler ship in attachment. For those who want to have three meals in restaurants it is...well... quite expensive. But what is really cheap and good in Norway is caviar (fish eggs). It is not salmon or sturgeon caviar, but some roe of other fish. A big 200 grams tube cost 1,5 dollars. It is very convenient food to eat on road, bus, train, ship. I was mostly on caviar diet. It is surprisingly many black Muslims in Norway. England and France brought them to their countries because they were citizens of their disappeared empire. Now they have a lot of problems with their fast growing Muslim population. Why Norway brought them? They did not have such an obligation. I have nothing against Muslims. I love to visit Muslim countries and I visited more then 10 of them. And I religiously obey their rules while I am there. But Muslim themselves do not want to follow other people's rules. Allah through the prophet Mohammed listed precise rules for proper Muslim's behavior in Koran. These rules are very strict and have exact prescription of proper behavior for any imaginable situation. Disobeying these rules is a great sin for Muslims. This is why they are not adaptable to other cultures . They will never become Norwegians! Those who decided to allow the immigration of large amounts of Muslims to Norway probably did not understand this. And the consequences for that action can be unpredictable. 11. French ladies whom I met 8 times during my trip.